MotoSUP XL - Extra Wide Motorized Paddle Board SUP. Extra Wide Motorized Paddle Board - MotoSUP330XL. Taking laziness as a motivation to the next level, we designed extra wide paddle board that is wide and stable enough to accommodate zero gravity recliner chair on top. Now you can comfortably recline backward, take beer in one hand and fishing rod in another, and silently glide along the waterways with a help of electric motor mounted on a built in transom at paddle board rear. Despite being wide, this paddle board goes very nice and fst with small 55lbs electric motor. New MotoSUP330XL has side tubes and very stable. It is great as small inflatable fun island, or as platform for fishing. Just mount your favorite chair, attach umbrella to chair with bungee cords, drop anchor, open cooler with cold beer and enjoy! Can be easily stand up paddled. Can also be used for towing gear behind Jet Ski using D-ring in front of board. WHAT WILL YOU NEED? 12V 35Ah & up battery, wall charger, 20 to 55lbs electric trolling motor, remote foot switch for trolling motor, kayak paddle and beach chair. Lanyard kill switch is also recommended for safety. Life jacket is a must on a water. WHERE TO GET IT? 12v batteries and chargers are sold on Ebay or Amazon. 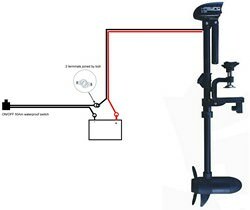 Trolling motors and kayak paddles are sold in our Accessories section. Trolling motor foot switch and optional kill switch are also sold on Ebay and Amazon. HOW TO ASSEMBLE? Inflate paddle board, and then secure beach chair to D-rings with optional tie downs or straps. Place battery in a rear section, and secure with tie downs between D-rings. Install electric motor on a transom, and pull double D-rings strap to keep transom in vertical position. Tighten motor shaft clamp to keep motor in a strait forward position, and turn throttle to the max. Steering left and right will be done with optional kayak or SUP paddle acting as a rudder. Connect one wire from foot switch to one of motor's wires. Then connect remaining two wires from foot switch and motor to battery terminals. Pay attention to polarity, red is (+) and black is (-). Secure foot switch to chair handle with bungee cord or wire, and you are ready to go! Add optional kill switch in a wire chain for additional safety. Always wear PFD. Full assembly should take no more than 10 minutes. Use rear lifting handles to lift loaded paddle board to and from water. 55lbs motor with 12V40Ah will run for about 1 hour at full speed. Lower speed will provide longer run time. Great as inflatable fun island for playing on a water. Great for fishing on a lake, pond, river or bay. Set of D-rings along board side for beach chair attachment. Extra wide board with side tubes supports provide unmatched stability. New version comes in attractive blue/gray color and set of D-rings. Not included: Electric motor, battery, paddles, seats, tie downs, foot switch. 37 x 22 x 10"